My wife and I recently took and excursion to Uxmal with your guide Angel. He was great! We had a wonderful time and really enjoyed his company. I’ve left a comment on your webpage but wanted to make sure you know how much we enjoyed our experience. Abbie and John were here back in March and Saul took them to Sisal. They evidently loved their day with us! I hope all is well! We had a fantastic stay in Merida, made more amazing by our time spent with Saul. He was a safe, professional driver, a highly informative guide and an all-around great guy we enjoyed getting to know. We could not be happier with our decision to use your company, as it truly elevated our experience in Merida by allowing us an intimate glimpse of life and history just outside the city. Thank you, thank you, thank you! Now I’m just trying to figure out how a foreigner can live in Merida - we absolutely fell in love with the city, history and Yucatecan culture! Angel was an amazing guide! My wife and I took a private tour of the Progreso area with Angel as our guide. He was so great to talk to, knew the area and took us to 5 beautiful cenotes and a small Mayan temple. The entire trip was perfect, with us getting a great cooling swim in a gorgeous cenote and lots of pictures. Angel provided snacks and drinks for the car ride (in a great car, leather interior and good A/C!). One of the highlights of the trip was eating lunch in an open air restaurant where Angel ordered us Mayan Tamales and Panuchos. The Panuchos were amazing... the best food we ate on the entire trip, including the cruise ship dinners! Paul and his family also came to the area via Carnival and Progreso. Here is their take on the private tour we provided them. I recently took my girlfriend and her children on a Carnival cruise. We were trying to plan some fun excursions while in Cozumel and Progreso. We looked through the cruise sponsored excursions, and nothing seemed to really jump out. Many of them had some positive reviews, but all of them also had their share of negative reviews. I happened to search Tripadvisor for things to do in the 2 ports, and that’s where I discovered Lawson’s. I knew that we were wanting to snorkel in Cozumel, and honestly I was way more excited about that originally. I thought we would do some amazing snorkeling in Cozumel, and it would be better to do some site seeing in Progreso, and so I clicked on “Things to Do,” and Lawson’s was number 1. Let me just say, it’s number 1 for a reason. While the snorkeling was fun... it didn’t touch our tour in Progreso. I checked their website, and the photo of Cenote at Sotuta de Peon Hacienda blew me away. I sent an email to Ralf, and he asked what the 5 of us wanted to do while in Progreso. I said that we wanted to see some ruins and we 100% wanted to swim in a cenote. He was very upfront and honest, and told me that our scheduled time in port would not allow us to visit Cenote at Sotuta de Peon Hacienda, but he had some other ideas that would be perfect for us. I gave him free reign to plan our trip. We left the port and boarded a bus down the 4 mile pier in Progreso. We were dropped off at the bus terminal (not the flea market thankfully), and were immediately greeted with someone holding a sign with my last name. Ralf introduced himself, and our tour guide David and our driver Roberto. And we were off. It was literally just 5 of us on the tour with them. It was OUR personal tour, just the 5 of us in a private van. David took us to a small village to walk around and have some local fruits and see what a typical village and market was like. We got to have some guaya and dragon fruit fresh at the market. The dragon fruit was an unreal neon pink, with small black seeds in the white flesh. We squeezed a little lime on it, dipped it in some chili salt, and enjoyed these local fruits. After leaving the market, we went to our first planned stop, Mayan ruins. Most of the cruise lines go to Chichen Itza, but over 10,000 people visit that site a day, and no one is allowed to climb on the ruins. Next we passed signs for Dzibulchaltun, but we kept going. Then we saw signs for Uxmal, but again, we kept going. I had heard of these 3 sites during our trip planning, but hadn’t heard of our destination, Mayapan. David told us that it is a smaller, lesser known ruins, but well worth it. We arrived at the site to find a whirlwind of butterflies gathered around a puddle of water. As we walked up to them, they flew around us in a cyclone of yellow and white. We then walked into the ruins, and had the entire site all to just ourselves. It was literally our ruins to explore. Seriously, there were only 6 people in the entire ruins! David told us about the culture and the temples, as iguanas ran and hid from us at every turn. When we got to the God Temple, David said that we could climb it if we liked. My girlfriend’s youngest son was already a quarter of the way up before he finished his sentence. I decided to join him, and the view was amazing! After spending a good 5-10 minutes on top, it was time to descend the frighteningly steep steps. There were definitely no building codes back then! As we left the site, David provided us some fresh mango to enjoy. Next was the trip to the cenote. I don’t know the name of the cenote that we visited, nor the village that was nearby. 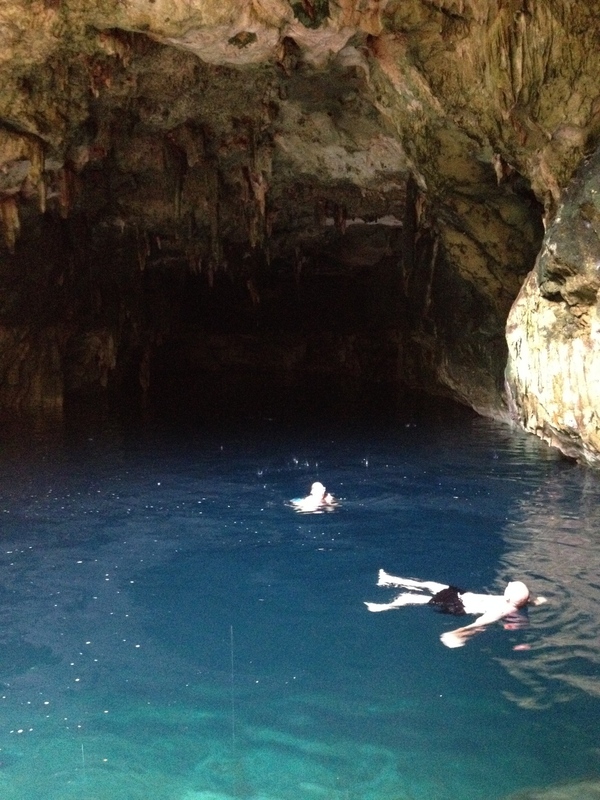 If I ever went back to Progreso and could find that cenote, I could swim in it all day long. We met up with Charlie in the village, and he biked ahead of us with his snorkeling gear to the spot. There was a scuba diver at the cenote, and David apologized for us not having private access to the cenote, but we didn’t mind. The sun streamed down into the cave at just the right angle to illuminate the surface of the water. It was a good 40-50 feet (I think it was that far) from the surface to the water down below. We walked down a wooden staircase built into the wall of the sinkhole and got to a platform at the water’s edge. I didn’t even test the waters, I just dove in. There is about a 20 foot section that is open to the sky above, and then a good 100 foot radius going into and underneath the cave, though the roof of the cave is a good 40-50 feet above your head! As we were swimming, one of the locals jumped in from a landing on the wooden stairs, probably a good 20 foot drop. So we decided that we should participate as well. The 2 boys and myself each took turns jumping from the stone wall into the clear blue waters down below. Finally David said it was time to go. But as we started to leave the waters, the scuba diver’s headlamp started illuminating the water down below us, it was a pretty amazing site. We came up to dry off, and enjoyed some cucumber and jicama for a snack. I mentioned Charlie because some of the other reviews talked about eating a home-cooked meal at his house. While we wanted to enjoy some local cooked food, we just didn’t have time with our time in port to do so. Maybe next time. It was a sad 1.5 hour drive back to the pier, knowing that our amazing day in Progreso was over. I honestly couldn’t have conceived of a better way to spend our time in port. That night back on the cruise ship, our fellow table mates at dinner were jealous to hear of our extraordinary excursion, and were a little disappointed that they hadn’t done a little more research to be able to have a similar experience. I can honestly say that our private excursion was about the same price as most of the other full day excursions offered by Carnival, but ours was just that... ours. It really was one of the best vacation highlights that I have experienced in my life, and I want to thank Ralf, Roberto, and especially David. If we are ever back in Progreso, there isn’t a moment’s hesitation that we won’t book another trip with Lawson’s. 100%. Absolutely. Natalie and her group came in on the Carnival cruise ship to Progreso. Another happy guest! I am so sorry that I am just now getting around to sending this email. But I wanted to let you know that our time with Angel & Pedro was fantastic! That was literally the best excursion I have ever been on and we made a ton of memories. Your guides are fantastic and very knowledgeable. The next time we are able to head that way we will definitely be checking out what new and exciting adventure we can go on with William Lawsons.